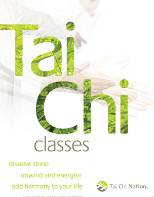 "Introducing even the smallest amount of Tai Chi into your week can enhance your life greatly. It can help you feel more relaxed, grounded and better able to cope with the hectic pace of modern life. In addition to the obvious benefits of slowing down for a while, Tai Chi classes can also become the beginning of a joyful journey of insight and personal development"
"A journey of one thousand miles begins with a single step"